Having an ideal domain name is really important for any business’s web presence as the customers expect to easily and quickly find information regarding your business. And, when you look for a domain name that works for your business, there are enough tips available for consideration. If you are thinking about how to find a perfect domain name, then you don’t need to look elsewhere. But what if you get a great name from your work? Then? This article will cover how to find an ideal domain name using Exabytes’s domain search feature and also some other options to acquire a pretty awesome name for your business. Are you up for it? Make certain that you have a set of domains ready to use. For thorough and comprehensive understanding, have a look at each step (with screenshots), followed by some extra methods describing how to find a domain name. Open your web browser and enter Exabytes.com in the URL bar. As soon as the home page loads, you will see a search bar from where you can start hunting your domain name. Enter a domain name and hit the Check & Order Domain button. At that time, you can expect one of the two things to happen. If your entered ideal domain name is available, then you’ll be given the opportunity to purchase it right away. And, if your domain name is already taken, you’ll be prompted to search for another domain name or pick a different form. To your relief, Exabytes offers a suggestion tool that shows new ideas having different endings or forms that you can review. If you happen to like any of the options, that’s a wonderful thing! But, if you don’t find any option winning, then keep entering some of your domain keywords in the search bar until you come by a right domain name. Bonus tip: Don’t push aside different domain extensions. 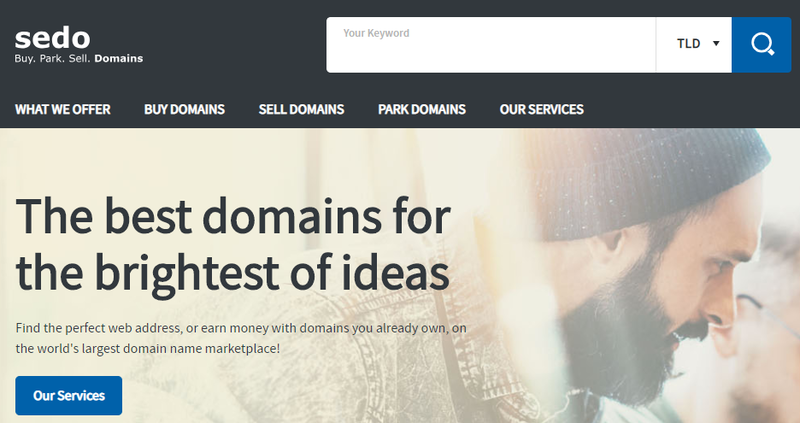 Although, .com is still one of the most extensively used and easy to remember domain extensions, there are thousands of new domain endings available in the market to give you the chance to perfectly represent your brand and the service you provide. The last step is to add your chosen domain name to the cart by clicking “Continue”. Now, the domain name is added to the cart. It is your choice to keep shopping for the domain names or head over to the checkout procedure. At that point, you are allowed to add more products to your cart like Website Builder, Startup Hosting or Domain Privacy to ensure that your online business is making a successful start. As you know how to find an ideal domain name with Exabytes, there are some other ways as well that you can use to find a right domain name for your business. Do you have any idea that there are over 30 domain extensions available in the market, which are more interesting and expressive. With so many domain extensions available, anybody can find an ideal extension suiting their niche or business. If you want to search by domain extensions, then you should visit Exabytes.com. Do you sell old books online? Possibly, OldBooks.store or OldBooks.shop will suit you perfectly. There are so many extensions available from which you can find the right one by keywords, categories, etc. Even if you are planning to buy an already-taken domain name or simply acquire a domain name that is no longer valid, you can get ahead with such a great place like Sedo Auctions. The process of finding a domain name here is quite effortless. All you need to do is enter your keywords or browse the lists to see which domain names are available. For buying or selling domain names, there is a wonderful online place called Afternic. As it allows the sellers to post their domains and share their listings with over a hundred platforms globally, Afternic is a great resource to find a suitable domain name. Simply enter your keywords on the home page and, Afternic will deal with the rest, taking you to the page having domains available for purchase. As you are no stranger to the methods of finding an ideal domain name, it’s the time to come out and get your favorite domain name registered for your business. When you get it registered, remember to link it with your website. What’s more? Exabytes Website Builder lets you build a compelling site holding additional attractive features in a few minutes that gives you a leg up on the competition. And, it would be amazing if you give it a go today for 50% off. Next articleHow can you acquire valuable names in the domain aftermarket?